The 2007 Utah Lindy Exchange has once again come and gone. And again, it was really really fun. I helped plan and run things again this year and was stressed out pretty much all of Friday and part of Saturday. After the Saturday night dance was underway and our team performance was through I was able to relax a lot more and really enjoy it. I met a lot of really cool people and had a blast. 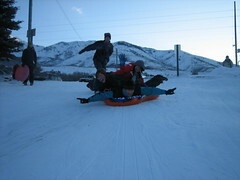 One of the most unique things we did that no other lindy exchange has one (or even could do) is sledding! I took one video. Should have done more, I think this the one I did is hilarious. The video is of me taking a sledding run. Enjoy. Oh yeah, click the photo for my photos. [Attempt at contact on your ryanware site] Ryan - what’s the real benefit of Mouse Trap when WinXP has an effctive screen-saver? You know Mike Lin sees nothing much in it. I’ve been long looking for an SS that DOESN’T blank the screen - so I can watch live stats while having the UI locked. MT doesn’t seem to do it. Program suggestion: How long have you been alive - in years, months, days, hours, minutes and seconds? How long, also, in ymdhms have you owned your current car? What was the date at which your father was as old as you are now in ymdhms? The main benefits over the screen saver and XP’s built in login system is that you can set Mouse Trap to trap at a certain time of day, and Mouse Trap will recover itself if someone reboots the machine in attempt to get past it. I like your idea for a new program. That’d be a pretty sweet application!